Spondylolisthesis in a 12-year-old girl. Sagittal 2D CT reconstruction image demonstrates grade 3 anterolisthesis of L5 on S1. Spondylolysis in a 13-year-old girl. A, 99mTc-MDP SPECT scan demonstrates increased uptake in the region of the right pars interarticularis of L5. 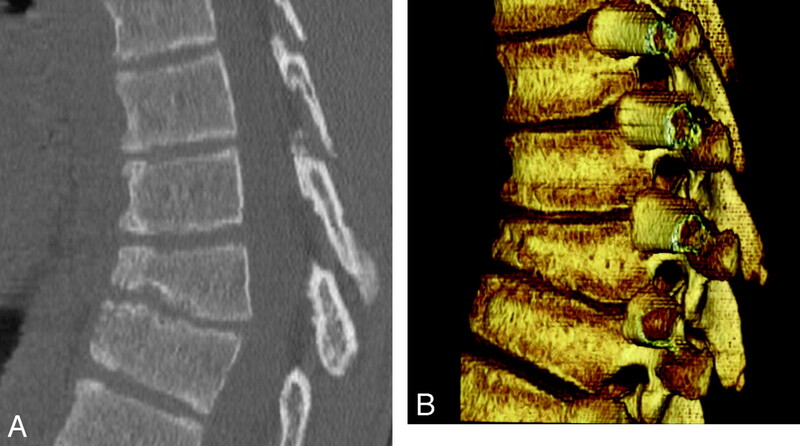 B, Axial helical CT image demonstrates bilateral spondylolysis at L5. C, Sagittal 2D reconstruction image shows extension of the right pars fracture into the right L5 superior facet. Spondylolysis in an 8-year-old boy. A, Axial T2-weighted image with fat saturation demonstrates hyperintense signal intensity consistent with bone marrow edema in the region of the pars defects bilaterally. B, Axial CT image demonstrates a complete pars defect of L5 on the right. C, Axial CT image demonstrates an incomplete pars defect of L5 on the left. Scheuermann kyphosis in a 15-year-old boy. A, Sagittal 2D CT reconstruction image demonstrates midthoracic kyphosis with anterior wedging of at least 3 consecutive vertebrae with presence of Schmorl nodes. B, Sagittal 3D CT reconstruction image demonstrates midthoracic kyphosis with anterior wedging of at least 3 consecutive vertebrae with the presence of Schmorl nodes. Scheuermann kyphosis in a 14-year-old boy. Sagittal T2-weighted image demonstrates thoracic kyphosis with mild anterior wedging of the T10–T12 vertebral bodies with slight disk space irregularity and Schmorl nodes. Minimal annular bulges slightly indent the ventral aspect of the thecal sac. Disk calcification in a 6-year-old boy. A, Axial CT image demonstrates posterior extrusion of a calcified disk. B, Sagittal 2D CT reconstruction image demonstrates calcification in the central portion of the disk. 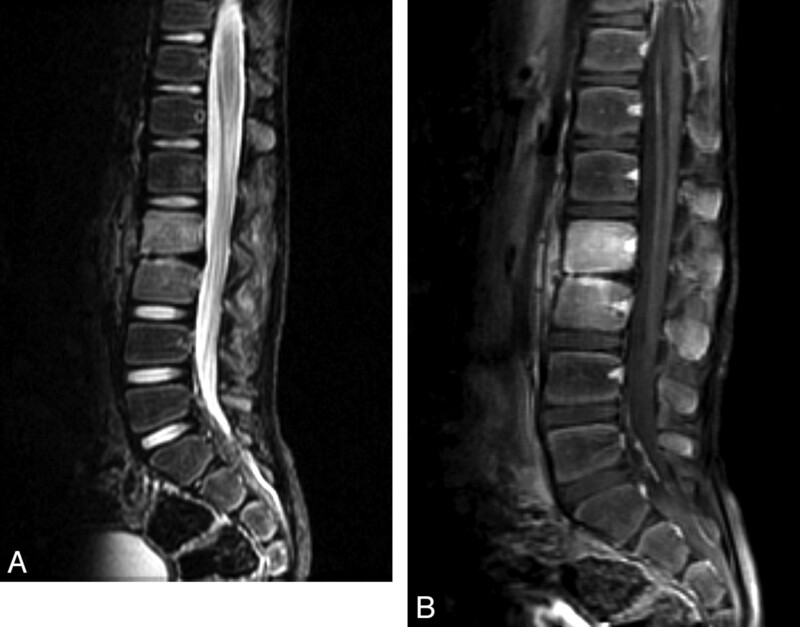 Vertebral osteomyelitis and diskitis in a 7-year-old boy. A, Sagittal T2-weighted image with fat saturation shows marked disk space narrowing at L2–L3 with hypointense T2 signal intensity within the disk. There is increased T2 prolongation in adjacent vertebral bodies. 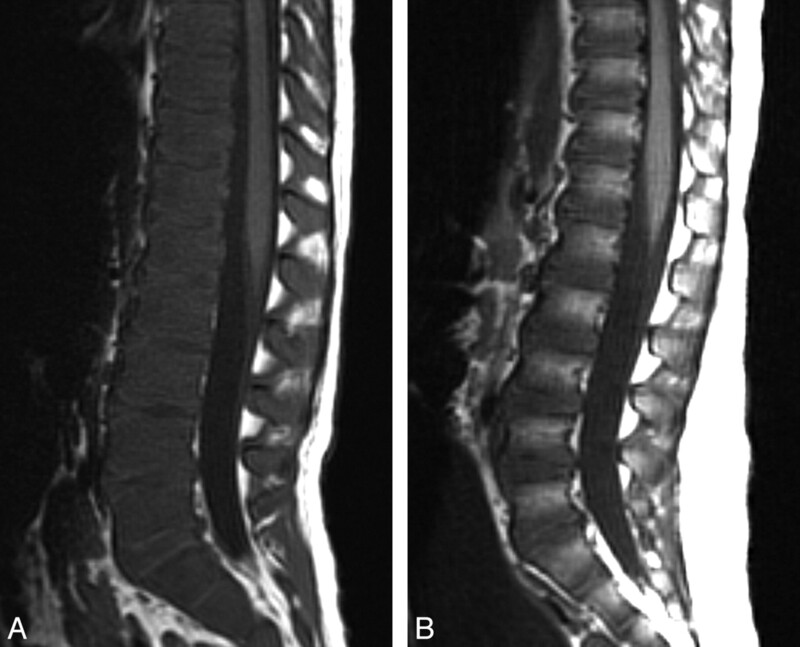 B, Sagittal T1-weighted MR image with fat saturation with gadolinium shows diffuse enhancement in the L2–L3 vertebral bodies and intervening disk space. Osteoid osteoma in a 14-year-old girl. A, 99mTc-MDP SPECT scan demonstrates mild increased uptake in the spinous process of L5. B, Axial CT image shows a lucency in the tip of the spinous process of L5 with surrounding sclerosis and a tiny sclerotic nidus. C, Axial T1-weighted MR image with gadolinium demonstrates homogeneous enhancement of the lesion at the tip of the spinous process of L5. Osteoblastoma in a 12-year-old boy. A, Axial CT image demonstrates an expansile lytic lesion in the pedicle of the C5 vertebra, which involves the C4–C5 facet joint and the left transverse foramen. 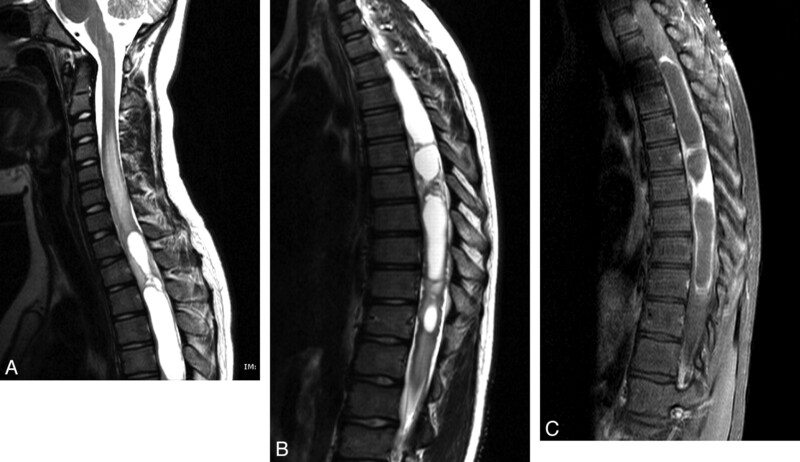 B, Axial T1-weighted image with gadolinium and fat saturation demonstrates extensive enhancement in the adjacent bone and the left paraspinal soft tissues of the cervical spine, with extension into the epidural space. LCH−vertebra plana in an 18-month-old boy. A, Sagittal 2D CT reconstruction image of the lumbar spine shows a collapsed L3 vertebral body. 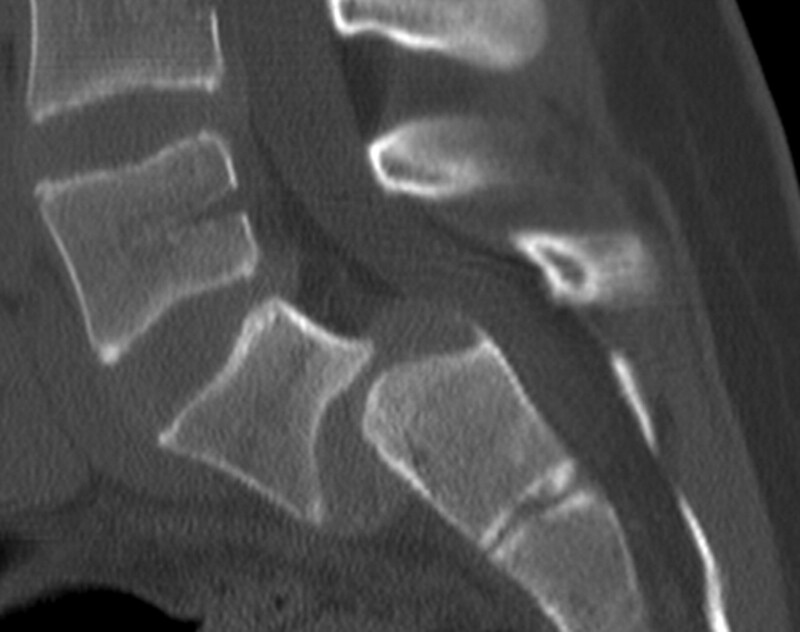 B, Sagittal T2-weighted MR image of the lumbar spine demonstrates a vertebra plana deformity with significant decreased height of the L3 vertebral body and preservation of the adjacent intervertebral disks. Ewing sarcoma of the lumbar spine in a 17-year-old boy. 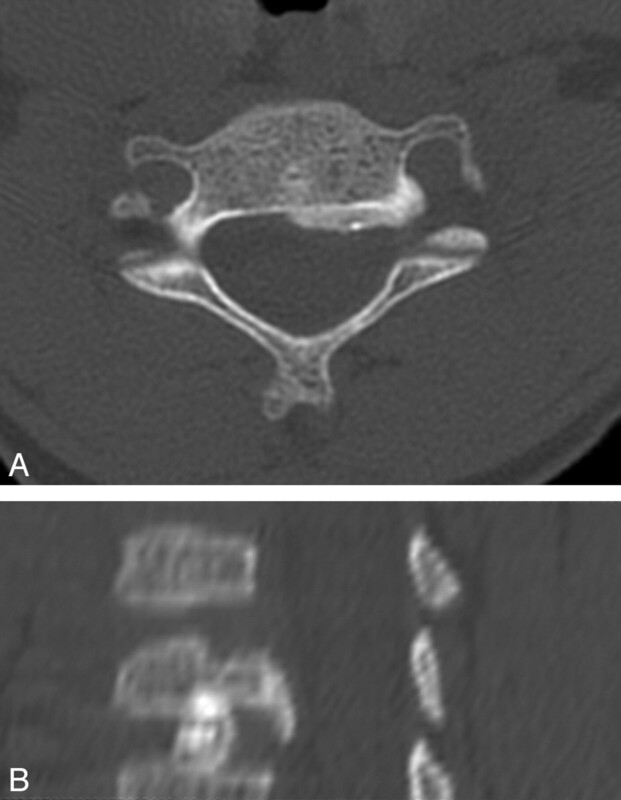 A, Post-contrast-enhanced axial CT image demonstrates a large partially calcified mass in the paraspinal musculature at the L3–L5 levels. The mass involves the adjacent spinous process and extends into the spinal canal. B, Axial T1-weighted postgadolinium MR image shows extensive enhancement of the mass with epidural extension. Lymphoblastic lymphoma in a 15-year-old boy. 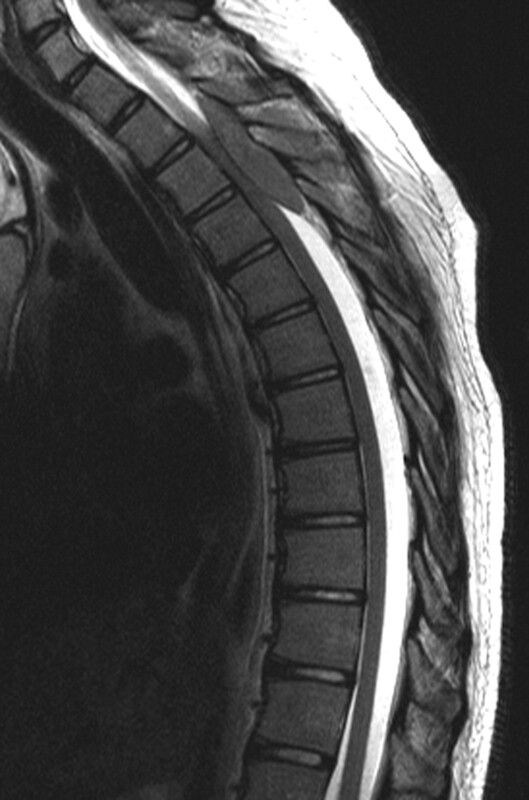 Sagittal T2-weighted MR image demonstrates an intraspinal extradural well-circumscribed hypointense lesion at the T2–T4 level with compression of the spinal cord with hypointensity diffusely in the vertebral bodies. Acute lymphoblastic leukemia in a 3-year-old boy. 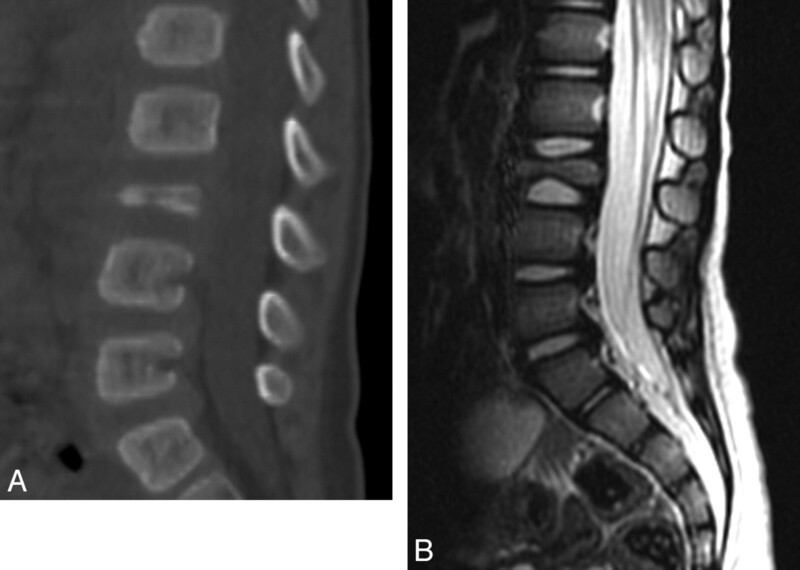 A, Sagittal T1-weighted MR image demonstrates diffuse abnormal low signal intensity in the lumbar spine bone marrow consistent with a diffuse infiltrative process. B, Sagittal T1-weighted image of a healthy 3-year-old boy with normal higher T1 signal intensity of the vertebral body marrow relative to the intervertebral disks. Astrocytoma in an 11-year-old boy. 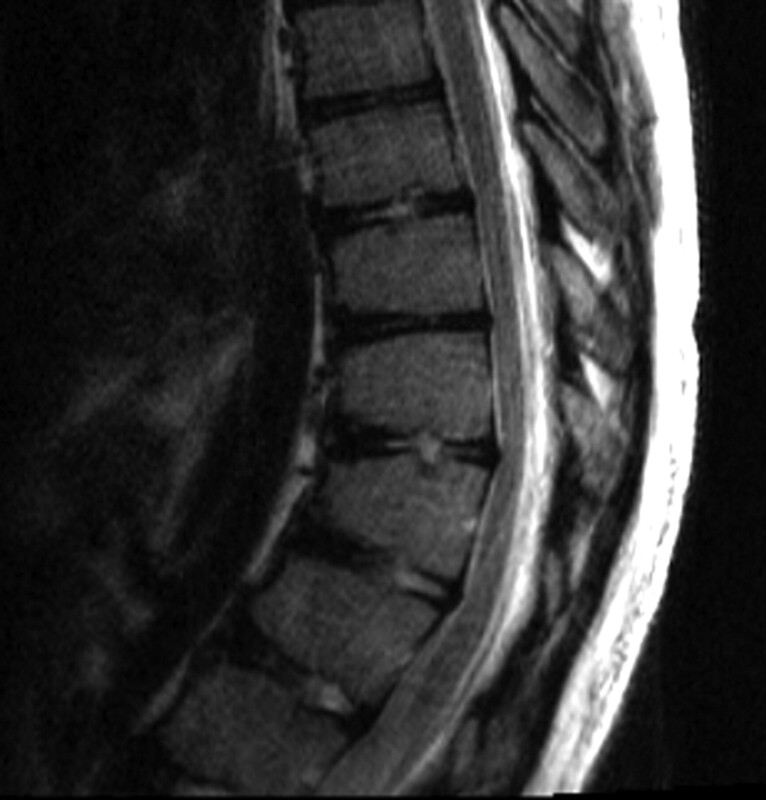 A, Sagittal T2 MR image of the cervical and upper thoracic spine demonstrates a partly cystic and solid intramedullary spinal cord tumor. 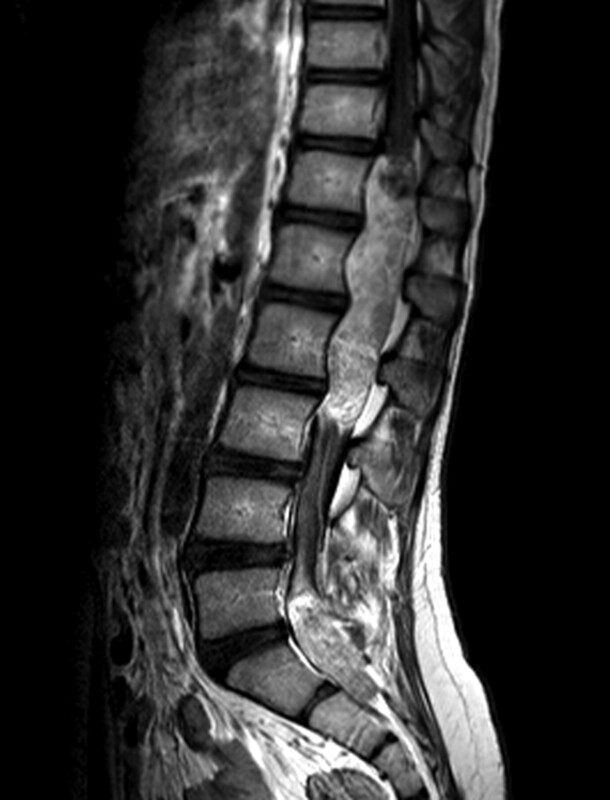 B, Sagittal T2 MR image of the thoracic spine demonstrates a partly cystic and solid intramedullary spinal cord tumor. C, Sagittal T1-weighted postcontrast MR image shows enhancement of the solid portions of the tumor and peripheral enhancement of the cystic components. Myxopapillary ependymoma in a 12-year-old boy. Sagittal T1-weighted postcontrast MR image demonstrates an intradural extramedullary mass lesion extending from the T12 to L3 levels and a second lesion at the L5–S2 level with diffuse enhancement. There is associated scalloping of the posterior aspects of the lumbar vertebral bodies.